Properties of Solids There are 16 products. Density Samples Set of 12 Brass. Each set contains 12 specimens of the same material, machined to different lengths. Determine the mass and volume of each sample and graph mass versus volume. The slope of the straight line that results is the density of the material. Includes 12 samples .Image may vary. Density Sample Set of 12 PVC. Each set contains 12 specimens of the same material, machined to different lengths. Determine the mass and volume of each sample and graph mass versus volume. The slope of the straight line that results is the density of the material. Includes 12 samples. Image may vary. 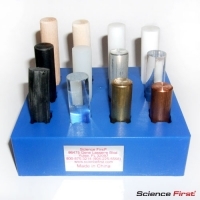 Density Sample Set of 12 Tecaform. Here’s a handy, low-cost set of five 10mm cubes that can be used in many experiments. What makes it unusual? It offers an array of the materials we actually use today. Learn about density, mass, volume, buoynacy, specific gravity and flotation while experiment with real-world materials. 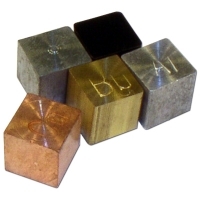 Our set includes one cube each of the following materials: Aluminum, Steel, Brass, Copper, Zinc. Density Blocks, Set of 10. 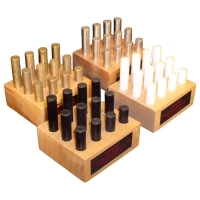 These 10 one-inch cubes can be used in many experiments. What makes this kit unusual? It includes a range of materials we actually use today. Learn about density, mass, volume, buoyancy, specific gravity and flotation using real building materials. 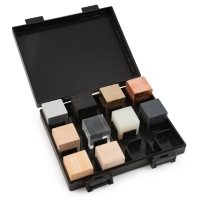 Includes ten cubes (aluminum, copper, nylon, PVC, steel, acrylic, pine, brass, oak and poplar), instructions, and a handy storage case. Twelve samples with different densities. It's a puzzle - it's a lab - it will separate the sheep from the goats. Ask your class to identify each of 12 different samples by determining their density. 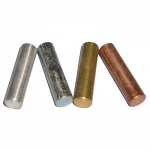 Each cylinder varies in size and density since it is constructed of a different material. All are 1.3 cm (1/2") in diameter and range between 4 and 7 cm in length. Includes 12 samples, plastic storage rack and instructions.